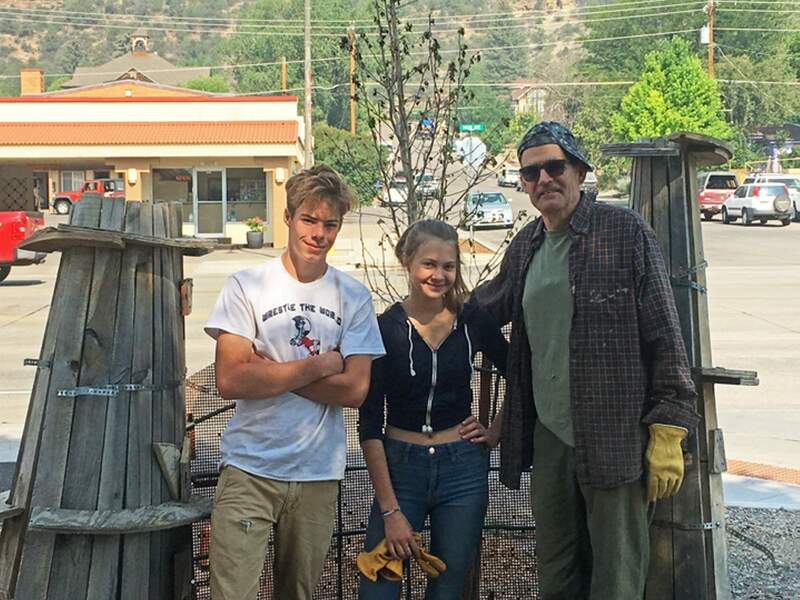 Student interns Pablo Smagacz and Sophie Schiavone are two of four have been working with artist Jeff Wise, right, on a new sculpture on north Main Avenue made possible through a grant by the city of Durango. At the corner of 31st Street and Main Avenue, artist Jeff Wise and four high school interns are building a new piece of art as part of the city of Durango’s plan to jazz up the north Main corridor. The city’s Public Art Commission approved $5,000 to fund the piece in June. It is the second piece to receive Durango Creates! funding. And for Wise, it’s an opportunity to go big. “I wanted to do something large and kind of make a statement,” Wise said. Wise, who has lived in Durango for the past 35 years, has been an artist his whole life, and said he sees this project as a way to mentor young people. On Tuesday morning, Wise was being helped by Durango High School senior Pablo Smagacz and sophomore Sophie Schiavone. He said mentoring is not only an important aspect of the project for him personally, but to the city as well. As an added bonus, the students will also have their art incorporated into the piece as smaller vignettes within the larger sculpture. Allowing them to have creative ideas is a fun part of their work on the project, Pablo and Sophie said. “I really like the creative aspect of putting your input into this,” Sophie said. The sculpture, which right now is still in its wooden form, but ultimately will be concrete, will consist of two towers separated by a wall that will have a bench for two built in. One of the towers will feature another tapering, steel tower with a sculptural element on top. The other tower will have a glass and concrete element on the top. Wise said he expects the piece to be completed by the beginning of next month. “It’s really neat – I think it’s really forward-thinking of the city to do these sorts of things, little human touches” Wise said. “And so the idea is you create sort of little oases in the north Main corridor and little pockets of really cool art and then it just sort of grows from there. “I think it’s really important to have. Art is important. Art is essential,” he said.